Each year, the Oxford Eagle opens its polls and composes a Best of Oxford for the year. Categories involve business, sport, and culinary art. The School of Applied Sciences is excited to learn that Dr. Linda Keena, associate professor of legal studies and coordinator of the graduate program, has been voted as Best University Professor in the Oxford Eagle’s Best of Oxford 2016. Dr. Keena has taught criminal justice courses for over 20 years, while her research involves restorative justice and entrepreneurship programs to maximize security prisons. She is a 2012 graduate of the Delta Leadership Academy and a 2014 graduate of Harvard School of Executive Education. She is also the mentor behind the criminal justice project that took first place in a legal studies national meeting in Denver, Colorado this year. This is the second year the legal studies department has taken first place in Oxford Eagle’s Best University Professor category. 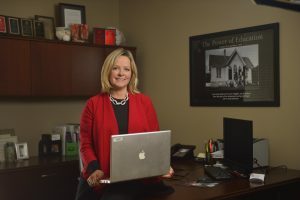 In 2015, Dr. Lorri Williamson, assistant professor of legal studies, received the honor.